Last month I had the opportunity to attend and act as an advisory group member for a really amazing event: Tactical Tech‘s Info-Activism Camp in Bangalore, India.Â The camp was truly international and truly diverse. There were geeks from Belarus, rural NGO representatives from Bangladesh, regulars on the conference circuit, and first-timers. The diversity at all levels was daunting and as participants trickled in on the first day, people clustered in regional groups. However, by the end of the camp, these distinctions had disappeared. 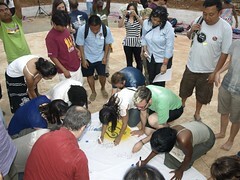 From morning circle to nightly community-building activities and training sessions, participants soon became peers and new relationships formed. Seeking to break down the traditional training hierarchies, Tactical Tech had a clear message: â€œWe are not here to lecture. We are here to listen to one another.â€Â Using a person-to-person (P2P) networked approach, participants shared with one another while experts facilitated the process. As camp coordinator Gunner once mentioned to me (and I paraphrase) â€œitâ€™s not only what you learn but how you learn thatâ€™s important.â€ The goal was not only for participants to leave for greater knowledge of info-activism, but confident in their ability to apply it. In addition to trainings, the camp also featured an outing day, a cultural bazaar, and that ever-helpful social lubricant – beer. Definitely not traditional conference fare, but there was a purpose.Â One goal of the Info-Activism Camp was to create an environment in which participants could form strong relationships with one another in order to create an international network to support one other as they implemented the ideas of the camp. From the unofficial indicator of number of group photos on the last day and tearful post-departure e-mails on the listserv, I would say this was largely successful. I feel very privileged to have been exposed to these new training models and to the community that Tactical Tech built. The value of the P2P approach is clear: if you do not empower the participant in the training itself, how can you hope to empower them to take action thereafter?